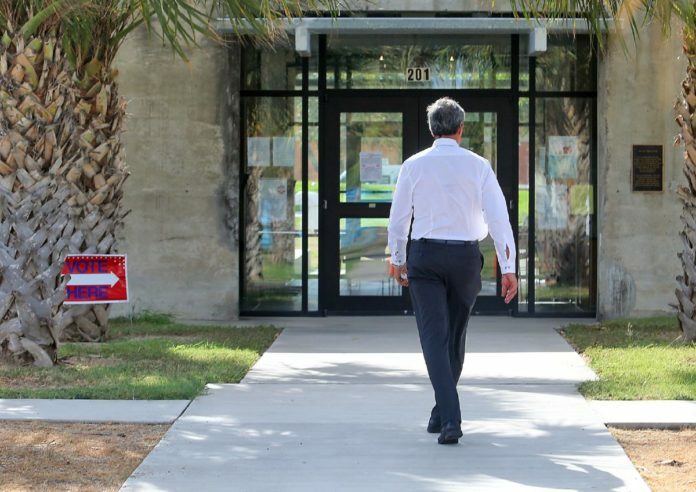 McALLEN — Voter apathy has plagued the Rio Grande Valley for years, no matter when elections are held — whether it be most of the region’s municipal elections in May or statewide and federal elections in November. Many local elected officials have said voter turnout bothers them the most during election times in South Texas, yet no sweeping changes have been made to boost turnout. McAllen Mayor Jim Darling brought an item to a joint meeting with the McAllen Independent School District Board of Trustees Monday night in a room at the McAllen Convention Center, a joint meeting that hadn’t happened since, many recalled, 2015. The meeting was an ideas session, a large workshop, where nothing of great significance was put to a vote, but it was a collaboration both the city commission and school board of trustees seemed to want more of. The first agenda item was a discussion about moving the city and school board’s elections from May to November, in hopes that the change would help spur voter turnout for local elections, but the two groups didn’t come to much of an agreement on where to go. Darling initiated conversation about the prospect of moving local elections from May to November. His top reason was voter turnout. While Darling won his 2017 re-election by a double-digit margin, he only received 4,409 votes. There were just 7,770 total votes cast in that election. At the time, there were 66,384 total registered voters in McAllen. Nearly 152,000 ballots were cast in Hidalgo County in the recent U.S. Senate race between Ted Cruz and Beto O’Rourke. Both candidates talked during the campaign about the gloomy turnout numbers in South Texas. McAllen commissioners would only opt to make a move, though, if school board trustees were equally interested. The two entities have long agreed to hold elections at the same time to avoid potentially confusing voters. Daniel D. Vela, president of the McAllen Independent School District Board of Trustees, entertained Darling, before the two groups listed pros and cons. While voting turnout seemed to be a concern among everyone at the table Monday night, there were more concerns. One was from Marco Suarez, trustee vice president. He raised a point that local elections would be at the bottom of the ballot during midterm or presidential elections. “Our ballots are already so many pages long,” Suarez said, citing voter fatigue and the local elections getting “watered down.” Some others agreed. A question was raised about the legality of moving elections, which Kevin Pagan, McAllen city attorney, mostly put to rest. Legislation will be introduced this upcoming legislative session regarding elections. Trustee Debbie Crane-Aliseda raised the concern about scheduling and partisanship. Currently, elections are held in May, as the school year is ending, so new elected trustees take office the following school year. If elections were held in November, the scheduling would be a bit trickier since they’d fall in the middle of a school year. Along those lines, local races are not party-affiliated. Candidates do not run with an R, D or any other party letter next to their name. Trustee Sam Saldivar Jr. called local politics and local government the “truest form of democracy,” and suggested not having a party affiliation is part of that reason. For now, the conversation to move the local elections from May to November seems to be just that, despite the dismal voter turnout locally. “There are too many unknowns,” Vela said after the meeting, though he added he’s not opposed to moving them, but they need much more information before seriously considering making a move.